The most common tool used in vehicle burglary and theft is a screwdriver! It's fast, easy and doesn't attract as much attention as breaking a window. What is the Jimmi' Jammer® ? A custom formed steel plate that bolts to the backside of your door handle, preventing thieves from prying into the handle seam or punching the lock cylinder into the door. In this case, the thief pried under the handle to get at the lock rod inside the door. Others may try to "punch" the lock into the door, breaking the handle plastic, easily and quietly gaining entry. The Jimmi' Jammer®, outlined in red, protects the lock components. 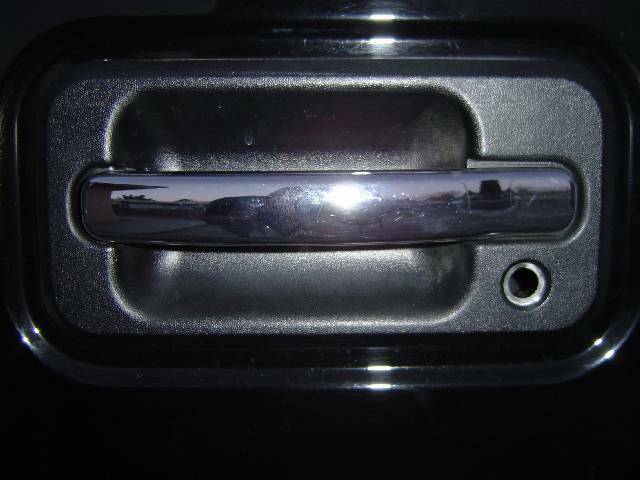 << The sketch to the left shows how the Jimmi' Jammer® plate (outlined in red) uses the factory handle mounting stud to attach to the backside of the door handle. When a thief tries to pry into the seam around the door handle, or punch the lock into the door, the plate is there to strengthen and guard the lock assembly. We currently have many models available for Chevrolet, GMC, Hummer, Ford, Chrysler and Dodge vehicles. To see a list of all currently available models, and more detailed information on each model, see our model list. 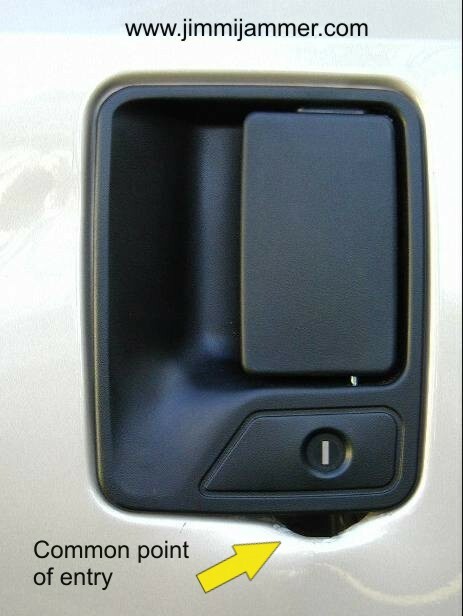 For vehicles on which this is common, we design our Jimmi' Jammer® to prevent the lock from being forced into the door. Notice on the sketch below how the Jimmi' Jammer® plate comes up behind the body of the lock and prevents it from being pushed into the door. Want to see how easy it is to steal a vehicle? Check our our 3 minute video showing an actual truck theft! Click on the link below to open up a new window. When your done viewing the video, just close the new window. New Products! Has your lock been "punched" or "jimmied"? Check out our PunchPlug™ and LockCap™ here. Made from solid heavy gauge steel. Bolts right in, no cutting or drilling. Comes with complete instructions and window warning labels. Two plates, driver + passenger side. See specific models for complete details. Have additional questions? Visit our FAQs page. See complete model availability on our model list. Installation tutorials are available for most models. Want to become a dealer for our products? Click here. See other customer photos in our Gallery of Horrors. Warranty and product liability disclaimer. See other links along left margin of each page. © Redline Technical Group, Inc.